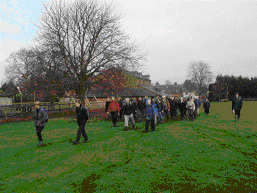 The first 3 walks of the West Anglian Way were a great success, and we look forward to three further walks to Cheshunt. Photographs taken on the walks by Mark Westley are reproduced with kind permission. Elsworth is situated between the A14 and the A428, some 13 miles West of Cambridge. The parish covers 1500 hectares of clay soil, except for an outcrop of limestone to the North of the village. A height of 65m is reached along the ridgeway of the Cambridge to St Neots road, but the village itself is low lying, and several houses were flooded in 2001. The population was ca. 600 in 1996, but the village has grown modestly in the last few years. Parliamentary Inclosure took place in 1803. A baker’s dozen of rights of way (including inner-village paths), are mostly in fair order, although in Winter the going is slow on the clay. Join me for a short walk around the village, then choose a longer walk from those below. I am starting from Broad End and using the footpath to cross the recreation ground diagonally, to emerge on Smith Street, opposite the Poachers Inn, now owned by the villagers, and welcoming to walkers. Across the recreation ground to the left are some willow-fringed ponds, the remains of Manorial moats. The Manor House adjacent is on the site of Abbot de Ramsey’s medieval manor. The village sign, at the junction of Brockley Road and Smith Street relates to village history, showing an ammonite, referring to the local rock outcrop, a shield bearing the arms of the Abbot of Ramsey, a cartwheel for village crafts, and a spray of wheat to symbolise local agriculture. Go South down Brockley Road, passing The Poachers, and take the second turning on the left, called “Spigot Lane”, between pretty cottages. This narrows to a footpath, and soon emerges onto Brook Street. Here turn right, following the raised footway beside the brook, with footbridges crossing at intervals. Where Brook Street turns North, becoming Church Lane, note the signpost and stile for the footpath starting of Walk (A). For the present, continue up Church Lane, and visit the C14th parish church which contains medieval wooden figures supporting the nave roof, and C15th carved stalls. Go through the churchyard, to emerge on the other side into The Drift, (start of Walk D). A green metal footpath sign here indicates a fenced alley running behind gardens, round a right angle to meet Boxworth Road. Go down leafy Duncock Lane opposite. Part-way down, on the left, a couple of steps lead up to another fenced alley through to modern housing in Roger’s Close. You need to look carefully to see the next fenced right-of-way opposite leading through to Paddock Row. In the corner, a green metal sign, part-hidden by a hedge, indicates the path where you finish Walk (B). Follow the charming Fardells Lane, with primroses and violets growing at the edge of the woodland in due season. Note the old houses raised well above the lane, for the little brook running beside it floods in heavy rain. 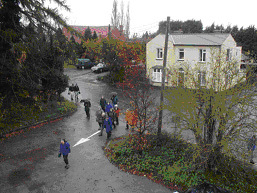 Turn left at the end, and walk back, past the school to the starting point. The path commencing Walks (B) and (C) is signed starting up the fenced side of the school grounds. Maps – Pathfinder 981; Explorer 225; Landrangers 153, 154. (A) Knapwell Take the fp S, joining the bp past Lawn Farm to the A428. Go E along the verge to the roundabout, and take the fp N past Coldharbour to Knapwell. Visit the Church and nature reserve, and return on the fp starting half-way along Knapwell village street to The Drift at Elsworth. (8 miles). (B) Hilton & Conington Take the fp from beside the school, towards Pitt Dene Farm, then the bp N to Hilton. Visit village green, turf maze & church. Take the permissive fp from TL 300 660 along track E, then NE to road at TL 316 673, follow road to Conington, visiting The White Swan PH and Church, returning by fp S to Elsworth (8 miles). (C) Hilton, The Papworths Follow route (B) to Hilton. With care, take the busy road S towards New Farm Cottages. Use fp W to Ermine Street, then signed bp to Papworth St Agnes. Note old bakehouse and church with fine flintwork. Find obscure start by garden, TL 268 643 to long path S to minor road at TL 271 624. Cross St Ives Road, and take route across fields to Papworth Everard Church. Go down Church Lane to A1198, turn left on footway, and go right up Wood Lane bounding rec. Follow the signed route through new housing N to fp joining farmtrack on high land running E back to Elsworth. (11 miles). Note – route finding may be demanding! (D) Knapwell, Childerley, Lolworth, Boxworth and Conington From Elsworth take The Drift fp past the church to Knapwell. Take Thorofare Lane, turning S to visit Childerley, spying splendid old house and private chapel. Take bp N to Lolworth, and W to Boxworth, visiting the church, and The Golden Ball PH. Use the long bp NW to Conington, and fp S to Elsworth. (10 miles on good paths). As regular subscribers to Cantab Rambler it is assumed that you are an audience that, as well as going walking, enjoys reading about it, and of associated countryside news. When recently gathering some magazines into a tidier heap, it became apparent that there is quite a range of these covering both the national and regional scenes. Nearly all of you will know The Rambler, official organ of The Ramblers’ Association which appears four times a year. We are familiar with the thoughtful articles on national issues, news, reports of local Ramblers taking action, listings of events, and articles encouraging the young, less able, underprivileged or minorities to join the RA. I find the letters generally interesting and the guidebook reviews trustworthy. Country Walking appears monthly in newsagents at £2.95 for a 100 page magazine packed with information. Many buy this particularly for the pull-out supplement with at least 25 walks per month, nation-wide. Most of these walks are on the shortish side (4 – 8 miles) for the serious walker, with a few up to 11 – 15 miles, but all recommend attractive walking areas, or a less busy approach to a well-frequented locality. Like The Rambler here are kit reviews, and advice galore, the latter perhaps aimed more at the novice. Do you try the where am I walking competition at the back ? Twice entered, but no success yet! The Great Outdoors is a similar monthly heavyweight, in terms of pages, but this one is directed at the tougher rambler, venturing on mountains, and having a greater emphasis on walking in exotic places. It is in here that we read of Hamish Brown’s “top 20” Monros – and decided to substitute the criterion of “greatest character” to that of “maximum difficulty”! More serious reading matter is provided by Footpath Worker, a quarterly bulletin, edited immaculately by Janet Davis of Ramblers’ Association Central Office, and aimed primarily at footpath workers (but available on subscription to other interested parties). Here we may study complex issues of path orders at public inquiries, court cases, cases dealt with by the Local Commissioner for Administration (Ombudsman), and sometimes accounts in dry tones of appalling mistreatment of paths, brought before the law. You will find also local authority matters, government reports, and details of new publications, e.g. the British Standard Stile. Equally serious and worthy is Open Space, the quarterly magazine of The Open Spaces Society. (Copies are sold separately to non-members at £3). Edited by Kate Ashbrook, this treats path issues in a more user-friendly format – with photographs, personalities, and a slightly less academic style. Open Space deals with commons and access land, but is equally at home fighting for footpaths, bridleways and byways. But what of the more local magazines? The venerable Southern Rambler covers what a boon the Van Hoogstraten case has been to editors! One can imagine the commuter perusing his (or her) Southern Rambler instead of the London Evening Standard, although, alas, it does not appear so frequently! Then we come to the Ramblers’ Association County A4 size bulletins, twice, thrice yearly or quarterly. Comparisons, they say, are odious, but here there is no comparison. “Stile” is edited by Justin Lumley for lucky Hertfordshire Ramblers; it runs to 16 sides, and is distributed to a very substantial membership. It has everything, including adverts, which no doubt help to pay for its production. Indeed, one remains puzzled that our Hertfordshire subscribers, already informed by Stile, bother with Cantab Rambler! Finally, there are the journals of the Icknield Way Association, and that of The Friends of the Hertfordshire Way, designed to support a long distance path and to service far-flung members with information. 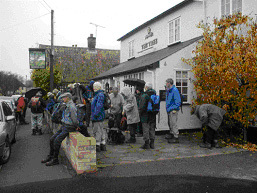 The Fen Rivers Way Association Journal produced a modest number of issues to inform and promote the path between Cambridge and Kings Lynn during its inception, and in the course of the sectional walk in 2001, and has now been merged with Cantab Rambler. Slightly different in emphasis from the above is the fairly new “Friends of the Roman Road and Fleam Dyke”, which produces an intermittent newsletter, packed with historical and nature notes, as well as information on the state of these important Cambridgeshire ancient monuments and trackways. It costs just £5 to be a “friend” and receive a newletter from Julia Napier, Sec., 30a Hinton Ave., Cambridge CB17AS, Tel 01223 213152. Practical help with scrub clearance etc is welcomed but not obligatory! Do we read all these, with their overlapping stories, and even borrowed articles, looking for variants in presentation or opinion, like a comparison of The Times and The Guardian? I suspect not – we just browse, looking for items of immediate interest. But thank you for reading Cantab Rambler! Thanks to the work of Duncan Mackay of Cambridge RA Group’s Committee, there is now electronic access to The Ramblers’ Assoc. Cambridge Group’s Millennium survey of the paths of South Cambridgeshire. Use www.higharctic.co.uk/footpaths, and search for the information by parish. If you think footpaths & bridleways are tediously muddy in Winter, it is always possible for a change to take a walk on the made-up paths in a park, or round the town. Imagine a time when nearly all roads were unsurfaced, and women wore ankle-length skirts to drag in the ubiquitous horse-muck! I was recently delighted to be introduced to “Royston 1900: A year in the life of a small market town” by S & J Ralls, published by The Royston & District Local History Society, 1999, and now reprinted. This book (A4 format, 208pp) includes items from the County Record Office, old photographs, and snippets taken from contemporary editions of The Royston Crow. We are given a real insight into the lives of residents 100 years ago, and of conditions in this little market town on the Herts/Cambs border at a time when the motor car & the telephone were just appearing, the bicycle becoming popular, and excursions and nature study on Royston Heath becoming not simply a preserve of the leisured and educated classes. The building now housing Royston Museum in 1900 (reproduced with permission, Royston and District Local History Society). Copies are available by post at £10 from David Allard, 8 Chilcourt, Royston, Herts., SG8 9DD, inclusive of postage and packing. (cheques ifo RDLHS) or for £7.95 from Royston Cave Art & Bookshop, 8 Melbourn St., Royston; Royston Museum; David’s Bookshop, 14 Eastcheap, Letchworth; Ware Bookshop, 10 Baldock St., Ware;and Sawston Books, 6 Morley’s Place, High St, Sawston. Cambridgeshire ramblers will be sorry to learn that Professor Thurstan Shaw, octogenarian President of the Ramblers Association in Cambridgeshire has been unwell this year, with three spells in Addenbrookes’ Hospital. He is now recuperating for the Winter in Shelford Lodge, 144 Cambridge Road, Great Shelford, and enjoys having news of walkers and their doings. Thurstan has a world-wide reputation as an archaeologist, but ramblers know him best for his work in founding the Icknield Way Association, and in establishing the Icknield Way as a long distance path. It was his great satisfaction to see the Icknield Way established as a regional route, but his ambition is to see it become a National Trail. Recuperating at home is Stan Hampton, following a heart bypass operation. We enjoyed visiting him recently in his bungalow at Wyton, and found him his usual chirpy self. Some 10 weeks after the major op, he is driving again, and now in the “top class” of the physiotherapy sessions at Papworth. Friends will join with me in sending good wishes, and we will look forward to seeing Stan, (former Treasurer of Cambs RA) on walks in the Spring. Cambridge RA Group and The Rambling Club are sad to be losing Judy Stoneley, who, with her husband Tony is retiring to the Isle of Wight in 2003. Judy has been a regular reporter of path problems to Cambs. C.C. Her major contribution to the Cambridge Group’s Millennium Survey of South Cambs, when she assisted the survey of no fewer than 251 paths in 2 years, will be valued in future by those who peruse the volumes of the report deposited at the County Records Office & in Cambridge City Library. Best wishes to both on your retirement and thanks for everything, Judy! Cantab usually appears every two months. A large number of you now receive Cantab by e-mail. By hand, 10p is appreciated to cover the cost of paper and ink. If you would like to receive an issue by post, please send a large SAE, and a 10p stamp.